A recent post on Tenkar's Tavern has me thinking about why I object to the Dungeon Crawl Classics RPG's use of charts for each magical spell. Given that I love charts, it comes down to a statistic sometimes called the Pareto principle. According to Pareto, 20% of causes are responsible for 80% of the effects in a given system. This is an interesting general rule that has some broad applicability. Here I want to apply it to RPGs and specifically to random tables. Specifically: in an ideal RPG design, 80% of the time I'm referencing charts, it should be to a core 20% or less of the charts in the game system. For instance, I don't mind referring to a combat chart, the experience table, a wandering monster chart, or the turning undead chart - they are all core activities. I'm able to optimize my access, whether it's through memorizing the charts, or knowing where they are, or having copies or a GM screen. DCC's spells break that efficiency, because you're stuck referring to them every time the spell is cast. People wind up playing where spellcasters have "spellbooks" with photocopies of the spells they're actually casting. Because everything's a fairly long description, it's a pain to memorize them; you probably have to look back at the chart every time. They're also not useful in the sense that each chart applies to only one spell. This is a poor contrast to, say, Spellcraft & Swordplay's spell retention table, or one of the better touches in 2e AD&D, the Wild Surge chart in Tome of Magic. Even critical hit charts have better ability to be spread across multiple uses than spell charts that literally affect only a single spell. If we apply the Pareto principle to gaming, 80% of charts should be things that are not referenced during play. These can be as particular and picky as you like - stuff like dungeon dressing, monster creation, magic item customization, and other "off-screen" details. The 20% of charts designed for play-time reference should be lean, mean, and memorable. You don't need to master the potion miscibility table, but you should have an understanding of the basic combat table that makes it easy for you to adjudicate it quickly. DCC is forced to virtually the opposite - 80% of charts used are one-off things, rather than the clever high-usage ones it does have such as the "turn over the body" chart. This rule of thumb, I think, is a good guideline for making reference charts for RPGs. Most should be aimed at the prep time, and those should feel free to be as intricate as you like. Only a minority should be true "everyday" charts, and these are the ones that need optimization so they can be both interesting and have results that can be memorized. I've been thinking a lot lately about human enemies in older D&D. It was certainly an assumption in both OD&D and Holmes that the wandering encounter charts would have you run into magic-using opponents. And it's obvious based on the source material that you'd want a magic-user as an enemy; it seems like at least half of the original "Conan" stories have some kind of spell-casting antagonist. But we only see them sporadically in low-level adventures. This is in no small part because a single Sleep spell can take out an entire group of low-level PCs with no saving throw. There are some ways around this. For instance, it doesn't necessarily follow that the magic-user will kill his opponents once he's cast Sleep on them. It's much more interesting to take some other approach, such as capturing them and imprisoning them (giving an interesting "jailbreak" adventure) or putting them on an undesirable quest, etc. There are a lot of interesting possibilities for a villainous M-U to mess with a party, including selling them off to humanoid slavers, or teleporting them to a foreign land. A second possibility is that, when confronted with an enemy magic-user, the standard shouldn't be for a party to rush in and fight; it's a good way of turning an encounter into a careful, loaded negotiation session where characters on both sides have their fingers on the proverbial triggers. The notion that each side can just "Sleep 'em" becomes something like the threat of a classic showdown. And of course there's always the chance that the MU doesn't have the Sleep spell and will instead use Magic Missile or Charm Person or something else entirely. Random spell generation goes a long way in ensuring that this is spread out in a "fair" manner - and any spells known may of course be in their spellbook for PC magic-users. This seems like it could also apply to magic-user spells with equal utility. After all, the referee is basically deciding when the MU will use one of their limited resources for the day; if it's possible to fight in another way, especially the traditional evil MU who hides behind flunkies, that spell might come in handy for the MU later (if he survives). It's also one of those little sub-systems that I think goes really well into old school D&D - just an odd little roll to tell you a specific thing. So with all that as set-up, I think it's time to stop worrying and embrace the evil wizard. 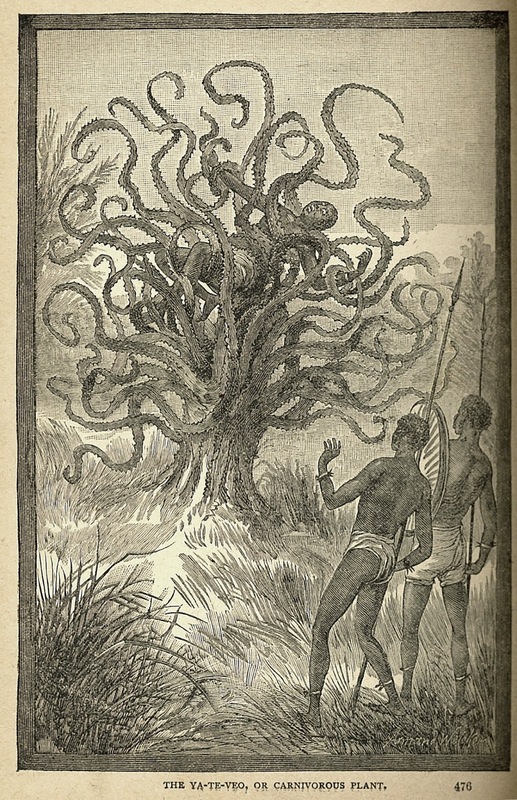 Every Wednesday on this blog is Cryptid Wednesday. I present one cryptozoological creature, written up for use in Swords & Wizardry. This one is from Africa. The ya-te-veo is a massive creature in the form of a tree with a mass of tentacles rising from a short, stubby trunk. It mostly subsists on insects and the odd bird, but finds human flesh irresistible whenever they come near. When it is dormant, the tentacles look like twisted, withered branches; several of them have eyes that resemble some form of rotting disease. It has a 3-in-6 chance to surprise a party unaware of its nature, with the chance reduced to 2-in-6 if the group contains a ranger or druid. It requires a Speak with Plants spell to speak with a ya-te-veo but it will not obey any commands. Anyone struck by one of the tentacles must make a saving throw or be caught up in them. A target thus afflicted is crushed for 2d4 damage per turn until dead (or a reasonable approximation), after which the ya-te-veo will drag their body toward its many-toothed maw to eat. If the ya-te-veo consumes a human, the referee should roll a saving throw; failure means that it is sated and will slowly stop its assault after the next round. The ya-te-veo takes only half damage from bludgeoning weapons. It takes double damage from any fire-related effect. One of the phenomena of the pseudoscience industry (and I use that term purposefully) over the last few decades is the theory of "ancient astronauts." 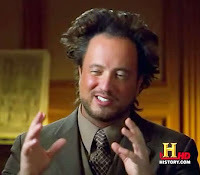 First spread by Erich von Däniken and used for commercial purposes by people like Giorgio Tsoukalos (the subject of the famous meme picture to the left), these use incredulity about the abilities of ancient civilizations and the building power of thousands of slaves to hypothesize that ancient wonders were not built by man but by extraterrestrial visitors. After all, with the goggle eyes, the weird armor, the cone helmet - that's gotta be something interesting to wear or to fight. Much of the ancient alien fodder is visually interesting. Can you really not think of adventure seeds with this guy? So there are several ways you could use the ancient astronauts. They are actual aliens, with straight-up science fantasy gadgets: ray guns, various detectors, deflector shields, anti-gravity devices, you name it. This take can be done either with the aliens as current visitors (and therefore "monsters" / encounters), or they can be long-gone, with their technology - up to and including spaceships - lost in ancient and forbidding tombs. Either way is fodder for adventure. This also works if outer planes are outer planets, as I've discussed at some length. Instead of standard science fantasy aliens, they are akin to the creatures of H.P. Lovecraft. This works particularly well if you want to play up the horror aspect of the game; heck, you could practically use a lot of At the Mountains of Madness as a campaign guide. 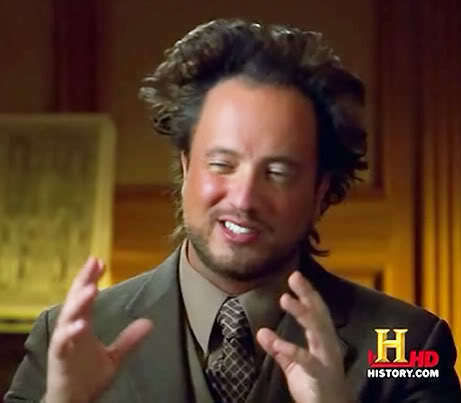 I also think "ancient aliens" as a surface cover-up would be a great way to do a dramatic reveal of some Lovecraftian horror in a lot of RPGs. The entities are actually gods or demons, if you want to go a pure-fantasy route. There's no reason that Dogū figurine can't be an extraplanar entity. Ancient tombs and pyramids are the obvious places to put these creatures; any dungeon that sits under or relates to a megalithic structure would really do. One thing I like is that it allows you to inject antiquity into the game (the ruins themselves are 2 or 3 civilizations old) - and it can be done side-by-side with death rays and force shields, without any incongruity. Fantasy literature and RPGs both have involved histories with bunk ideas. Theosophy in particular I think had a big influence on fantasy, including on Lovecraft and again on the outer planes - we wouldn't have our astral and ethereal if people hadn't actually believed in them. In an age where there is bunk abound, it seems a shame not to turn some of it to good use. 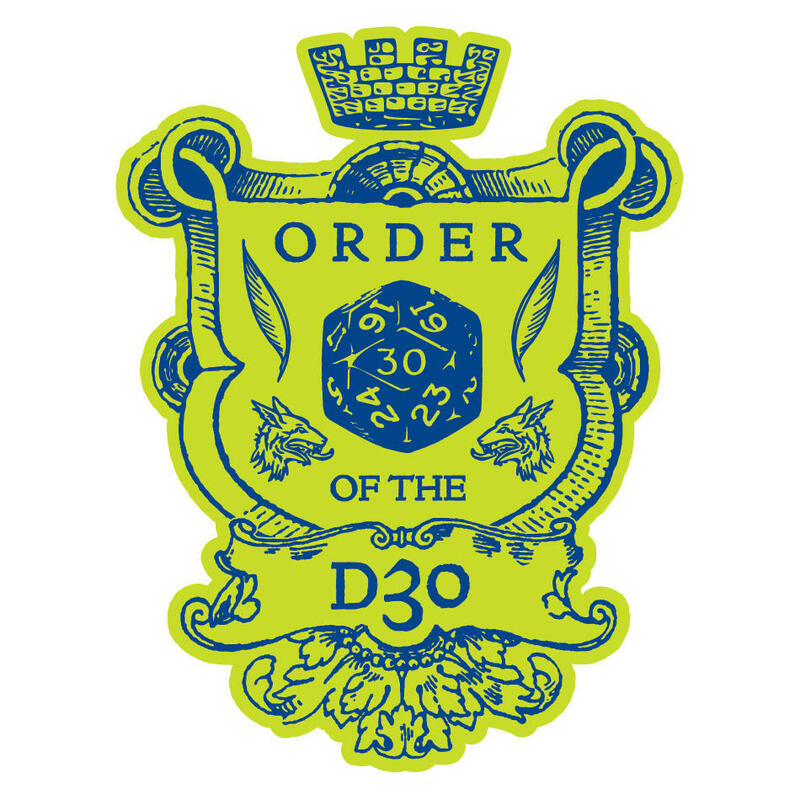 This post on RPGnet has had me thinking a bit about original D&D's alignment and the languages associated with them. Alignment languages seem to be a sticking point to many people, which I understand - in AD&D they don't quite make sense since people are so fragmented between the nine alignments. But for OD&D I like it. Underlined Neutral figures have a slight pre-disposition for LAW. Neutral figures can be diced for to determine on which side they will fight, with ties meaning they remain neutral. The underlined Neutrals, for the curious, are Elves and Rocs. Wizards appear for Law and Chaos, and Giants and Lycanthropes can go under Neutral or Chaos. The reason I bring it up is that it makes fairly clear what alignment was at the dawn of D&D: it meant there were basically two sides, and there were neutrals who could go either way or stick to themselves, like Switzerland. This idea is simple and makes perfect sense of why alignments exist. As for Law and Chaos, these are taken from two sources. One is Michael Moorcock's Elric novels, which are better known than the source that they borrowed from. Poul Anderson's Three Hearts and Three Lions was the first modern fantasy to create an explicit Law vs Chaos conflict. Moorcock expanded this, both in his cosmic scope and the length of the works treating it. In Chainmail, it's actually much closer to Anderson: these are sides in a conflict that is happening here and now. Dungeons & Dragons makes it a bit deeper. More types can switch between columns - Men can be in any column, and lycanthropes are spread across (mainly because of Werebears, which can be lawful). Very little else is added; there are swords which have alignments, certain effects on clerics based on alignment, some bits given about characters in castles, etc. But the biggest come in the language section. Law, Chaos and Neutrality also have common languages spoken by each respectively. All other creatures and monsters which can speak have their own language, although some (20%) also know the common one. So for 80% of creatures, there are two ways to speak with them: you can know their language, or if they are of a similar alignment, you can speak in alignment tongue to them. It's a bit risky, though, as we see soon after. One can attempt to communicate through the common tongue, language particular to a creature class, or one of the divisional languages (law, etc.). While not understanding the language, creatures who speak a divisional tongue will recognize a hostile one and attack. This is why alignment language is a good idea in OD&D. Three pages earlier, we had a list of all kinds of creatures that have various alignments - so for instance a Neutral PC could try and talk with the Minotaur in the Neutral alignment language, even though nobody in the group speaks Minotaur. Of course this could go horribly wrong, since some Minotaurs are Chaotic, and will attack if you speak in Neutral to them! Orcs, Ogres, Dragons, Chimerae, Giants and some Lycanthropes also vary between Neutral and Chaotic. Lawful PCs run the same risk talking to Centaurs, Werebears and Rocs, and - in an interesting twist - Elves. All this makes OD&D alignment much more interesting than AD&D's alignment. Rather than an all-pervasive cosmic force or a way to categorize the outer planes, it's an immediate question of where you stand among the creatures in the world. A Neutral can get Giants on their side - but only some of them, while it takes a Lawful to converse with a Hippogriff. Chaos is bad news, as all the undead are there along with Evil High Priests and Balrogs - the big threats from OD&:D that really fell by the wayside in later editions. I'm curious for the comments as to who's done much with alignment tongues in your games. In the interest of developing some Swords & Wizardry content, and following through on my desire to make up some cryptids, I'm hereby declaring Wednesday to be Cryptid Wednesday on this blog. We'll start with a modern classic. Best known for killing livestock (particularly goats), a chupacabra is a reptilian humanoid with scaly grayish-green skin. Sharp spines run down its back. They stand 4' tall but can jump as far as 20' in a single powerful hop. The chupacabra is a hematophage, that is, a blood-eater; it latches on with powerful jaws and if the victim fails a saving throw will extract blood, doing 1d3 damage per round. 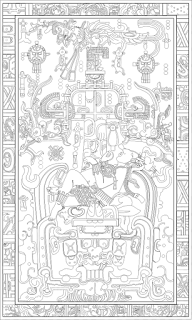 If over half of a victim's blood is drained in this manner, there is a 25% chance that a vital organ is sucked out by the chupacabra, and the victim will die in 2d6 turns without magical healing. If cornered, a chupacabra has a 2 in 6 chance of giving off a piercing screech. This will alert any creatures within earshot. When it screams the creature's eyes will also glow deep red and it gives off a stench like brimstone, a combination which forces observers to make a saving throw or be overwhelmed with nausea for 1d6 rounds. The chupacabra is intelligent but does not speak any tongue known to man. Its forked tongue makes its speech more akin to that of serpent-men. They tend to be solitary hunters and will have a fight-or-flight reaction to humans. There's a school of thought in the Old School movement that says that monsters generally should be unique things. I understand this impulse even though I don't subscribe to that school of thought - mainly because I love books of monsters. 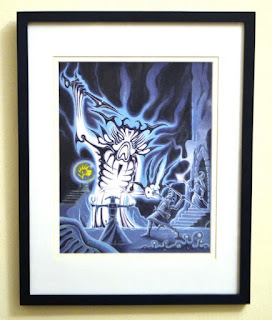 Lamentations of the Flame Princess and the recent "Psychedelic Adventures" series by Geoffrey McKinney have gone the furthest in seeing this through, although there are discussions to this effect by others. Seeing Better Than Any Man, the LotFP Free RPG Day release, has sort of cemented some of my thoughts on this. One result of this is that there are, well, unique monsters. These are cool, because they're always new and different. Sometimes they follow themes, such as the animal-like creations in Geoffrey McKinney's Isle of the Unknown and Dungeon of the Unknown. (The former is usable as a virtual bestiary on its own.) Other times they're just truly bizarre things, like some of the creatures of Better Than Any Man. There are plenty of good routes to go here, and between Matt Finch and James Raggi's books for designing monsters, there are good resources to go any of them. The second thing you see in these modules is a lot more human antagonists. It's quite easy, and indeed some people champion the idea, to have the entire cursus honorum of humanoids replaced by humans of various aspects and types. Bandits, brigands, cavemen, berserkers, and so on become more important, as do unique humans with class levels. It makes a world where some humans are the worst monsters of all. At the same time, I've found that parties are less likely to charge blindly into combat with humans instead of at least attempting parley, so it's a mixed bag overall. The last thing we see is a lot of giant animals. Mutant animals, magic animals, animals that are extra vicious for one reason or another, insects, mammals, reptiles, arachnids - pretty much running the gamut. The tendency to do this is pretty universal among the modules I've reviewed, and it has interesting world-building implications. Why is the world full of giant/mutant/magic animals? Does it have hybrids like owlbears? Where do beast-men fit in all of this? The questions are interesting. One thing I'd like to see is fantasy fauna - that is, animals that are mundane but otherworldly - sort of a fantasy equivalent of the thoat, calot etc of Barsoom. It'd make these a bit more varied. On the whole, I enjoy the modules that use this approach. They're fresh and different, and have useful ideas. But as a great lover of monster books I can't go along with the idea, even though I enjoy the fruits of their creations. The diversity in all this is really one of the best things about the Old School gaming movement today. So, I've been thinking about exactly how I want Dungeon Crawl #3's lifespan to go, and future issues in general. And it's worth doing a bit of a balance sheet on how issues #1 and #2 will go. Dungeon Crawl #1 had a short print run that went pretty well - I had the time to print issues and mail them out individually. But after the wave stopped, and it was just a trickle, it became a problem to do the issue and get it out on time. The PDF has been free since January. The second issue has been successful in PDF, particularly since I switched it over to Pay What You Want. I'm very happy with those numbers. But the print-on-demand option is much too expensive for what I wanted, and even though I'm extremely happy with how it looks as a printed book, I've only sold seven copies. The Lulu print option doesn't seem worth continuing to pursue for individual issues. For issue #3 and going forward, here's what I want to do. The PDF will always be available on the day of release on the OneBookShelf sites (RPGNow / DriveThruRPG). I would like to stick to the $4 cost here. After 3 months, the PDF on OneBookShelf will switch to Pay What You Want. All back issues will be available perpetually in PWYW. Each issue will have a one-time only print run. Basically, this will open on the same day as the PDF sale, and there will be a limited number of copies and an end date. Each person who buys a print copy will get a free PDF copy emailed from me. Once the ordering window closes, I will make the print copies on my laserjet printer and they will be mailed out as a single batch. This will cost less than the current Lulu copies. There will be a Lulu print on demand compilation every four issues (like with Fight On!). This will be available as a softcover book. I think that's the only reasonable way to use the Lulu printing services. The first compilation will be available sometime after the print run for Dungeon Crawl #4 finishes. So: what do folks think? I want to get back to a balance between the print zine and the PDF models, and I think this is the best way to navigate all those issues. Which would you want? So a few updates on Dungeon Crawl, because that's just fun. First: the Pay What You Want edition of Dungeon Crawl #2 is now in the hot items section of RPGNow! It's not selling for huge amounts of money, but it really means a lot to me that folks are responding and enjoying the content from this issue. 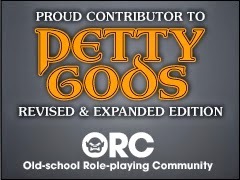 The screencap to the right was taken from the RPGNow home page while I was writing this. Thank you to all the folks who've been purchasing this and especially to the great writers and artists who worked with me. Second: the dungeon I was working on for Dungeon Crawl #3 is getting ... a bit out of hand. Initially it was a 2-faction dungeon with two levels, but now it's a 4-faction dungeon with three levels. Too big to fit into the magazine, at any rate, and I think it's going to define all of its own original creatures between giant animals, demonic rats, goat-headed men and a certain coleopterous species. So I will have to be spinning this off into its own release, and I'm still weighing options on how I want to publish it. If any publishers out there want a 32-page module designed for 3rd level PCs with demonic and Lovecraftian overtones, I'm working on one. That leaves me without the biggest entry for the issue. Third: I've decided what I want to do for a dungeon in issue #3. This goes along with the general Holmesian theme I've been going with lately. What I'm thinking now is to create a follow-up, in a fairly similar style of map and overall tone, to the Sample Dungeon on pages 40-44 of the Holmes rulebook. It's a good, open, exploratory dungeon with some interesting NPCs and unique encounters, and I think following it up with a slightly bigger level would be a great 1st/2nd level module. I'm thinking that the second level of the sample dungeon (I'll probably call it "Beneath Port Town" so as not to use Portown as a name) should use some of the material that shows up in the Holmes text without being explicitly detailed, detailing them and providing them for the adventure. Also some tributes to the original (I'm thinking some remnant of a giant crab, etc) to tie it together more strongly. So that's roughly where things are at. I'll keep updates on the blog on the progress of Beneath Port Town and the other dungeon as I have them. 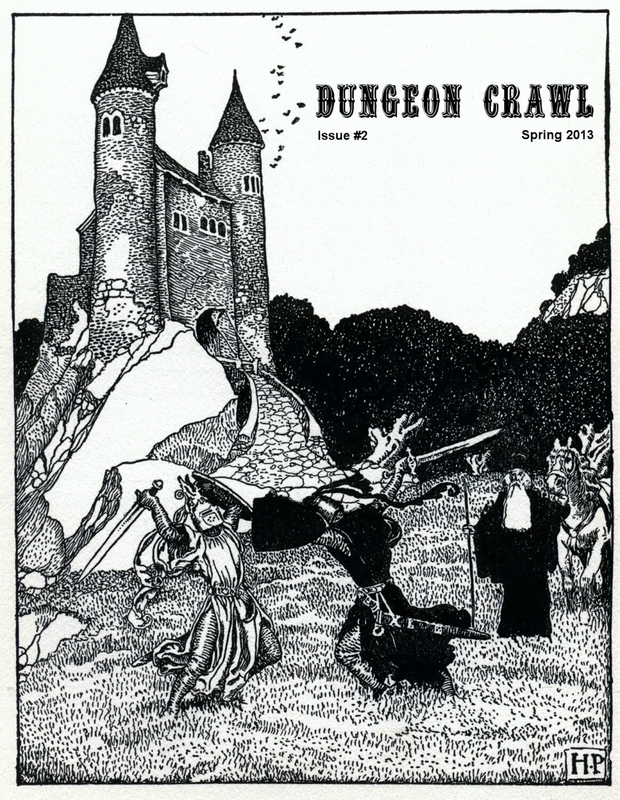 Also, please don't forget that submissions are still open through June 30 for Dungeon Crawl #3 material! Email me at wrossi81 at gmail dot com with your ideas. In my last post, I hinted at the idea of using expanded classes in Holmes Basic Dungeons & Dragons that only become available at 4th level. I don't like the term "prestige classes" because, to me, they speak of bloat and excess and character builds in 3.x D&D. Since in OD&D, 4th level equals Hero, I think that Heroic Classes is a more apt title. The paladin in Supplement I: Greyhawk is, I feel, the archetypal heroic class. It has stringent requirements (17 Charisma, Lawful alignment, few magic items), and a fairly limited set of powers (lay on hands, immunity from disease, +2 to all saving throws, dispel evil at 8th level, Holy Sword, paladin's horse). This is a good template. I particularly like how the "dispel evil" ability is given at 8th (Superhero) level, since that firmly establishes a baseline of 2-3 abilities at Hero level, and another at Superhero. Druids from Supplement III: Eldritch Wizardry would also adapt well; they get a separate set of spells from spell level 2 onward, with the identify pure water / plants / animals and pass through abilities at 4th level, and their shape shift gets moved back to level 8 - when it will be powerful but not overwhelming. As for a new heroic class, I kind of like the idea of an Alchemist for magic-users. This would be something of a specialist in the creation of magic items - focusing on temporary and rechargeable items at 4th level, and permanent ones at 8th. One thing that would go particularly well with this would be an "identify" ability as a base ability. Of course, making magic items would take significant time and effort, and possibly some hard-to-find items. This pairs particularly well with the Holmesian scroll-making capability. I think this could work without going too far overboard. I think keeping it sharply limited to 3 abilities plus 1 at 8th is a good way to start. One way to balance things out may be to create different progressions for heroic and non-heroic class characters. Basically, if you're a paladin, you get your abilities but stick with your base fighter progression; if you stay as a basic fighter, you get extra attacks, which are a very big thing in older D&D as I've mentioned before. Now, the one thing about all this is that it kind of means I need to actually write a Holmes Expert expansion. So there's that. At least I can limit it to 48 pages. 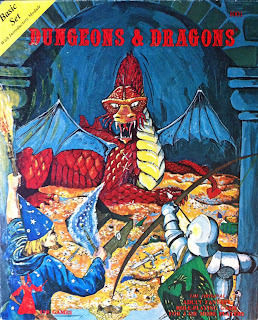 Jeff Rients did an excellent post reviewing the rule book for basic D&D that I started with, the 1991 Black Box. 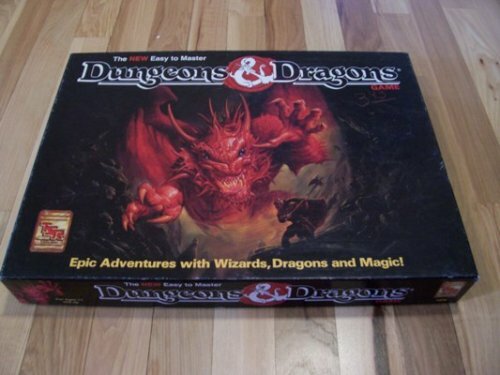 This was the board game style release of D&D, in several ways: it came with a boardgame style map of "Zanzer's Dungeon" and stand-up counters, and it was the width of a board game instead of a smaller box. There's a certain whiff of nostalgia that gets me seeing that dragon leaping out of the cover that Jeff doesn't get, and rightly so - it's not a great piece of art. Still gets me, because I played through the Dragon Cards four or five times before I actually played D&D with a group, and played some of the other battlemat style adventures as solos. This reminds me of my very start. What this brought up for me is the question of rules choices. You should know by now from reading this blog that my heart will always be torn; I love original D&D, but I don't run it day to day. I also have become very fond of the Holmes set despite not having started with it - which is honestly the most interesting bit for me, as I think there's an impression that the appeal of Holmes is largely driven by nostalgia. But a stripped-down simple core, to me, is just such a wonderful and elegant thing that I wouldn't mind saying I was going to run games primarily with Holmes from here on out, adding and removing different parts as necessary. S&W Complete gets good marks and I'll keep running it for my current game but my heart lies with Holmes and OD&D. Part of the reason I think Holmes is so promising is that I think it goes exactly far enough with the game as is. Up until 3rd level, things are fairly set, and you have the low level D&D experience the way it's supposed to be. It's when you hit 4th level - and this is important, since it's "Hero" level - that the game becomes wide open. That gibes with me philosophically, that the game starts to shift when you hit Hero rank. One later innovation that could really work well with this are the ability to get into specialized classes and abilities only after 4th level. I'm thinking something along the lines of BECMI Companion style Paladin / Knight / Avenger / Druid type subclasses, perhaps expanded a bit, but sharply limited in terms of scope - just a handful of abilities. One central point is that this streamlines character generation but leaves the possibility for more down the road, after the character's personality is more established. With the eleven AD&D classes, unless you dual-class, you're pretty much locked in. I think this would be an interesting direction for an "expanded Holmes" beyond just reincorporating OD&D or AD&D material. As for the "Brown Basic" (which I prefer to think of as Black Box, both are BB D&D), I like the idea of reincorporating a couple of its minor rules. Bed rest restoring d4 instead of 1HP/day seems reasonable, as does the notion of an "Exhausted" penalty ("'Exhausted' foes are +2 to be hit, while you are -2 to hit if exhausted. I'm still looking for a rule on how you become exhausted.") And this is just fun: "Wooden doors can be burned or destroyed in 1d4 turns." There was a section I remember in the Dragon Cards that also introduced the Expert-style roll under stat on 1d20 for ability checks when players improvise. Thoughts are welcome both on expanding Holmes after 3rd level and on Black Box D&D rules. One thing that I've noticed recently in running Swords & Wizardry is a couple of the little things that have an impact on the game. I want to talk about one that comes from S&W and one based in the Holmes rules. Swords & Wizardry gives fighters the benefit of extra attacks versus creatures with 1 hit die or less. This has a big impact, giving the fighter a serious advantage. Quantity of attacks really matters in old school D&D more than either hit dice or armor class, given how things average out. It also makes a much more significant gap between 1HD opponents and 2HD enemies, which I think I like: the bigger foes are more dire threats. Very interesting dynamic. This is part of the key of old-school D&D, in whichever edition: if you play with too few PCs, you won't do well. People often look at the game's lethality, particularly in OD&D and "classic" (Holmes, B/X, BECMI, RC), as something that needs to be fixed - but it's fixed by sheer numbers. Quality of troops comes into it in certain ways, mainly in the ability to maintain those numbers, but Mike Mornard's core advice is correct. People wishing to survive the megadungeon should go into it with nine characters. The other little tweak that's having a big impact is scroll creation, since I use the Holmes rules. It really gives magic-users a feel of not being useless until 5th level, and also helps "fix" their excess of wealth otherwise. The M-U in our Stonehell campaign has been using it for Sleep, which is great for avoiding fights where you're outnumbered. A quirk of this that I've been thinking about is "inheritance." That is, once an M-U has made a scroll, it's there even if they die. This could come in particularly handy when a higher level M-U dies in the campaign with several scrolls in tact; a fresh replacement (1st level) would still be able to use, say, Web or Fireball or what you will at least once in a game. So let's open this for conversation. What tweaks have you found to make a relatively big impact in your games? The OneBookShelf services (including RPGNow / DriveThruRPG) now have a "Pay What You Want" option for their download-only products. Which is a very cool new way to be going things, and I like it. People should be able to get gaming material, particularly older book PDFs, for as much or as little as they value it. 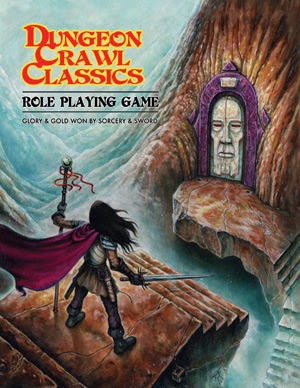 So as of today, Dungeon Crawl #2 is available as a pay what you want product on any OneBookShelf site! 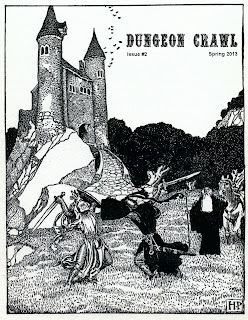 If you haven't bought Dungeon Crawl #2, think about it! As a general policy, in the future issues of Dungeon Crawl will continue to be a fixed price for the first 2 months of their lifespan, after which they will switch to Pay What You Want. Bandits have the odd distinction of being the first type of monster described in Monsters & Treasure, which makes them out in very wargame-style terms: there are 30-300 of them, and there are leaders of various levels and different types of weaponry etc. In essence, bandits are a "default" opponent in the way that orcs became through play and modules. 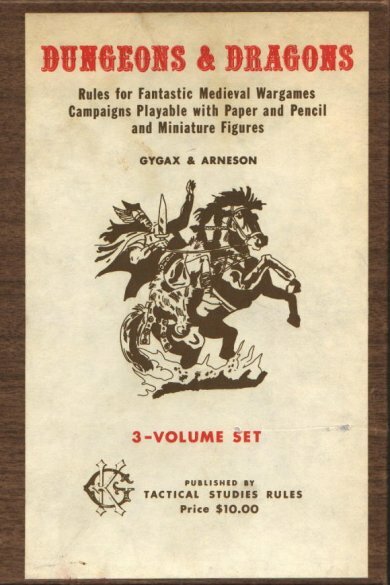 Now, bandits are staple villains; some people, like Bryce Lynch, call for bandits to replace many of the orcs, hobgoblins and so on of adventure modules. I've done that in the past - my high school games involved many groups of bandits as a "so we need a combat this week" quick fix. My feelings on bandits is mixed. They're very flexible and easy to swap out, and a bandit encounter can vary from negotiation to combat quickly. A defeated bandit makes for a henchman in a pinch, even if he's not going to be left alone much. And they are fond of ambushes. But at the same time, uninspired bandits are even less interesting than the cursus honorum of humanoids. To do bandits well, particularly in a published module, I think that they should have some differentiating factors. And of course, if you've been paying attention to the themes of this blog, that means charts. Even in a fantasy role-playing game, the things that motivate a bandit can still be complex. I'm thinking that there are four types of bandit, some of which are better at working together than others. There are the bandits who are "honest" thugs and have no illusions about what they do, who see survival and enrichment as goals in themselves or means to a fairly base end (women and wine, et cetera). Other bandits are "realists" about their activities but harbor hope that they will eventually be able to return to an honest living. 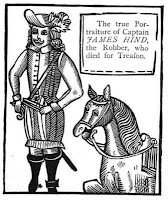 A third type of bandits are "social" bandits, who picture themselves as Robin Hood types, but in many cases wind up falling short of a standard of "rob from the rich and give to the poor." Finally there are the "megalomaniac" sorts, who view banditry as a way to become a bandit leader and eventually carve out some bandit kingdom all their own. 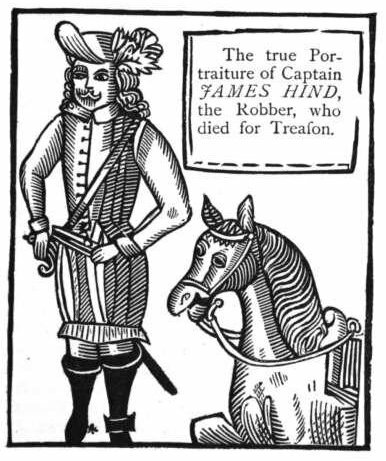 Different types of bandits will occur in the same group; the leader is probably an "honest" or "megalomaniac" type, while the newer recruits are "realist" or "social" in disposition. Note that social bandits, even ones who are genuine in their beliefs and actions, may not cooperate with PCs - especially if they are seen as members of the hated upper classes. Megalomaniacs may seek cooperation if the PCs align with their grand schemes, while realists may react differently depending on whether the PCs may have known them in pre-bandit life. And of course, megalomaniacs often disguise themselves as other motives, particularly social bandits, playing at Robin Hood while taking their cut. 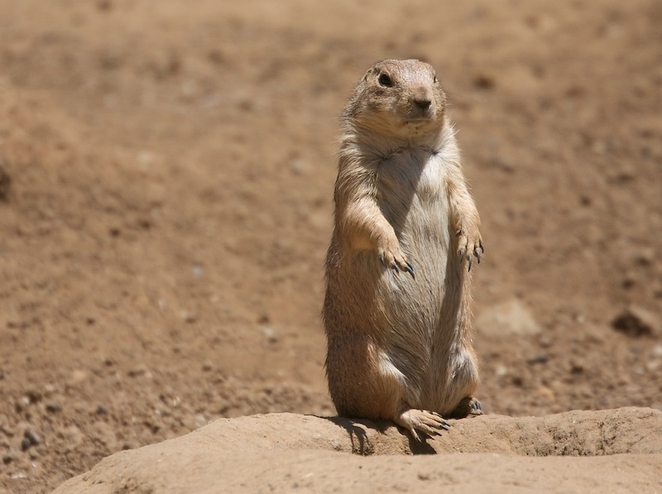 Prairie Dogs: America's Meerkats - Language is a short video talking about the language that prairie dogs in the southwestern United States speak. Through a series of short, chirping vocalizations, prairie dogs convey useful information about an approaching predator that seems to convey an avoidance pattern. They can distinguish not only the predator but the size, shape and the dominant color; this has been tested to the point where the same human with different shirts will be described differently. All of this is in a short pitched call a tenth of a second long, repeated several times. Other vocalizations don't have an accompanying behavior so it's not clear what they mean. It's a neat bit of nature and, as the video speculates at the end, this is probably only the beginning of our ability to decode meaning in the calls of animals. This kind of thing is useful to think about in a game that has spells like Speak with Animals. In the video we learn that prairie dog language has rough semantic equivalents to nouns and adjectives, but not to verbs. I'm thinking that when speaking with animals, a few simple verb-like things can be conveyed such as "run", "hide", "attack", "eat" and maybe for some types of animals "take" but the possibilities should be fairly limited. And of course it would vary for some types of animal, so some might understand "climb" or "push" but others maybe not. Of course what makes it interesting is that you have to actually describe the thing you're talking about, to some extent. Now, a giant rat would probably understand "orc" since he's seen it; using Speak with Animals to describe an orc to a ferret might be more challenging. What's interesting in the prairie dog video is that they never confuse dogs with coyotes, and they do invent words for shapes, so the cleric using Speak with Animals may actually wind up coining some new terms in his target's language! Extrapolating a bit from the existence of the spell, it may be that people in the D&D world have actually done investigation, perhaps with teams of researchers, one conversing with an animal using Speak with Animals and the other listening without aid of the spell, transcribing the conversations, and using them as a sort of Rosetta Stone to decode the animal languages. So for instance, a druid may be genuinely able to speak with the black bears in his forest, or magic-users could send messages by speaking with ravens (who we already know are highly intelligent). In game terms, this could allow clever characters to learn the language of an animal companion such as a ferret, which would then serve as a sort of scout around the dungeon in the vein of Beastmaster. A Magic-User being able to speak with his familiar cat, or a paladin with his warhorse, etc - the list of uses for this sort of thing is not a short one. Of course the limitations are real, so for instance the ferret or cat shouldn't be able to count, but knowing whether it's an ogre or a group of kobolds in the next room is certainly knowledge worth having. And it makes the fantasy world just a bit richer.